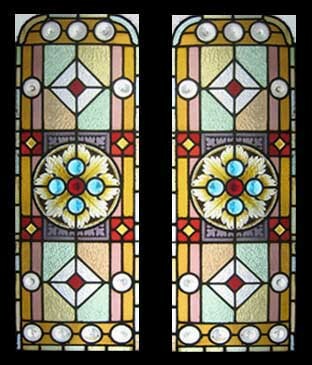 These beautiful old Jewelled PAINTED windows have outlived the original frames . The colours simply divine.Would look at home at the top of a staircase. Removed from a house in Historic City Of York during refurbishment. The glass has no chips or scratches. The leading is in excellent condition. The colours in this glass are exceptional. The frames each measure 18 1/4 "H x 44 1/2"W . The glass measures 15 1/2 x 41 1/2"
shipping and packing WORLDWIDE would be $199 You can buy this now using the paypal link below the photograph or e-mail sales click here to arrange payment by personal check ,money order or bank transfer.